Pygmaeocereus familiaris is a beautiful minitature species with neat rows of white spine clusters. 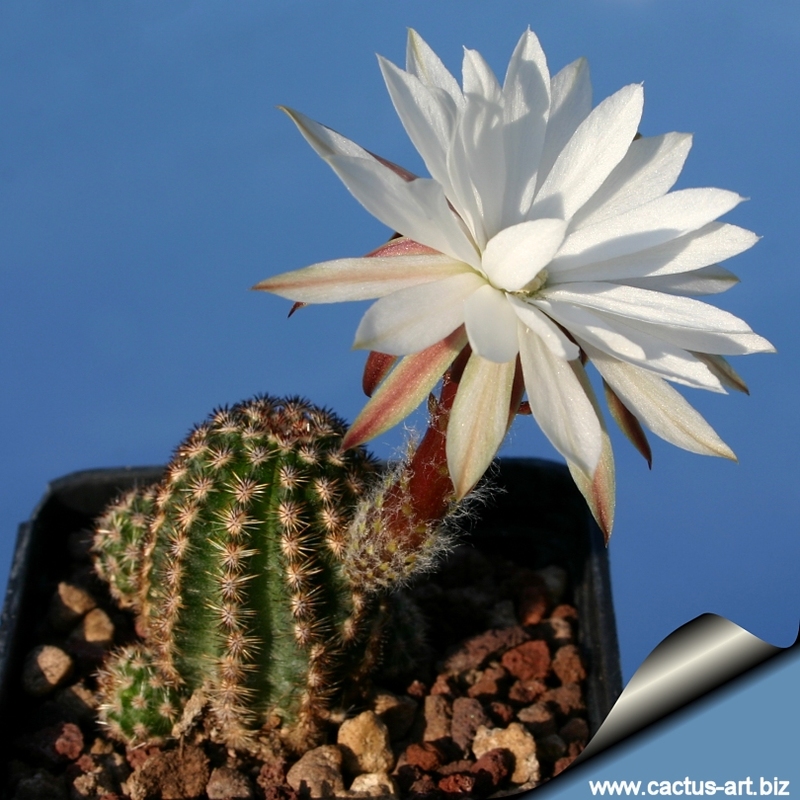 The flowers are pure white, tubular and tend to bloom in the evening. Description: Small, clumping, often forming small mats with many stems, often barely rising above ground level. Stems: globose to short cylindrical, green, up to 2 cm tall, 1-2 cm in diameter. Ribs: 9-14 (Usually10-12), 2-3 mm in height, wavy, tuberculate. Central spines: 4-10, rust to black colored, stout, up to 2 mm long. Radial spines: 15 to 25, glassy white, 1,5-3 mm long. Flowers: Nocturnal, funnel-form, up to 8 cm tall, white with a long, slender floral tube. Cultivation: This species is easy to cultivate, because of the elongated fat taproot - the plants need deep pots and a well drained mineral potting mix (at least 50% sand or pumice grit.). They also need a sufficient amount of air. 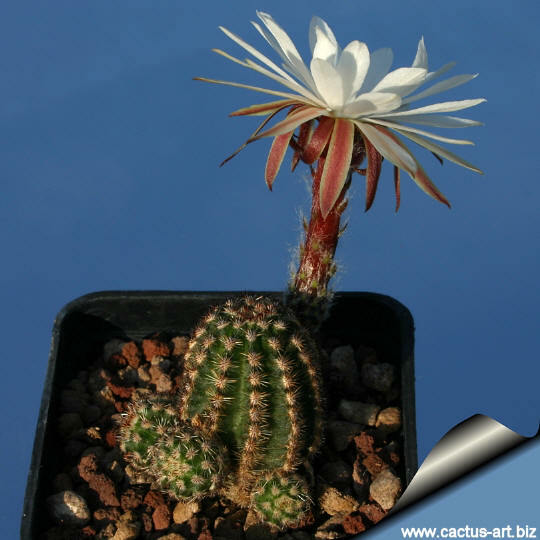 Full sun or light shade and careful watering are required, to keep plant compact and in order to keep spines strong and dense. They are susceptible to overwatering, and require a dry winter rest. It is better that they be repotted regularly. Repotting will increase the number and size of stems, and will increase the number of flowers produced. Repot yearly until the plant reaches about 5 cm in diameter, then every two or three years will suffice. Repotting is best done at the end of winter, but it can also be done at other times. Do not water for a couple of weeks after repotting, to reduce the risk of root rot via broken roots. All, especially the young, are susceptible to red spider mites. Frost Tolerance: These plants tolerate light frost (- 2 °C for a short period). They need to be kept in a cool place (min. temperature around 5° C) during winter rest. This is important for the flowers as well as for their health. Without this cool winter period they normally won't get many buds. Propagation: Usually propagated by cuttings, seeds and grafting . Grafted plants in cultivation sprout strongly. Also considered as an Haageocereus by some authors. Origin: Peru, Arequipa, Near Chala. Habitat: This species is found on arid hillsides along the coast of the sea often growing in extensive populations. The plants are often almost completely covered in fine gravel. The region is characterized by little if any rainfall. They depend on the frequent, though seasonal, fogs. 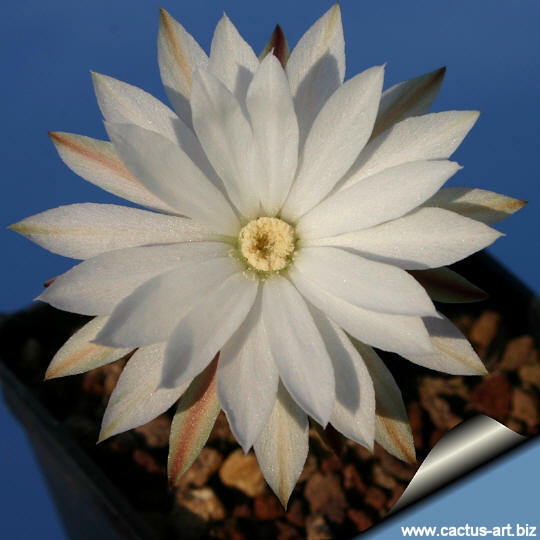 Etymology: The genus name "Pygmaeocereus" is derived from the Latin "Pygmaeus", meaning "Dwarf". Thus dwarf cereus. The species name comes from the Latin "Familiaris", "pertaining to the family" for the clustering growth.